Jason Heroux lives in Kingston, Ontario. He's the author of three poetry collections, Memoirs of an Alias, Emergency Hallelujah, and Natural Capital, all published by Mansfield Press, and the novella Good Evening, Central Laundromat (Quattro Books, 2010). 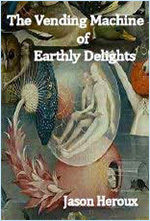 His most recent publication is the poetry chapbook The Vending Machine of Earthly Delights (Origami Poems Project, 2013). His novella We Wish You a Happy Killday is forthcoming from Emmerson Street Press in the fall of 2014. DADA, Surrealism, and the Cinematic Effect by R. Bruce Elder • Wilfrid Laurier University Press.